This article provides effective solution to help you get back deleted photos from hard drive, SD card, flash drive and Android devices. Free download photo deleted recovery software and recover deleted photos via simple steps now. Taking photos with smart phones or digital camera is a common way to record important moments such as family time, children’s growth, travels and more. 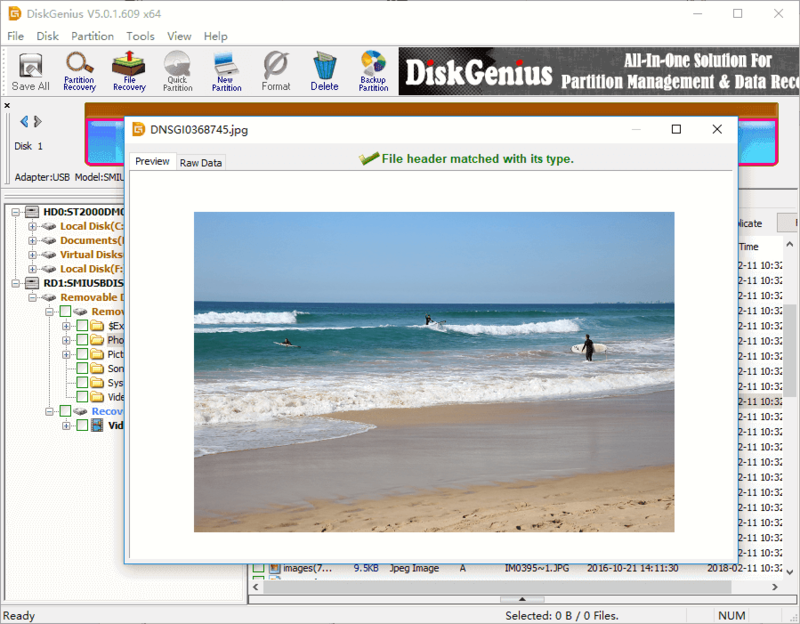 Hundreds of photos can be saved on computer, camera, phones, SD card, etc. but these files cannot avoid data loss issue, for example, you may delete photos by mistake, drive may get formatted, Windows crashes, SD card stops working and so on. Most of us must have the experience of accidentally deleting photos and that can be a heart-stopping moment especially when data loss happens to important photos which have not been backed up. Windows system provides Recycle Bin which tries to prevent users from deleting data by mistake. Deleted files can be restored from Recycle Bin to their original location before Recycle Bin gets emptied. However, USB drives like memory card, USB flash drive or external hard drive does not have a Recycle Bin. However, deleting photos is not the end of the story. In most cases, deleted photos are recoverable with the help of photos recovery software. 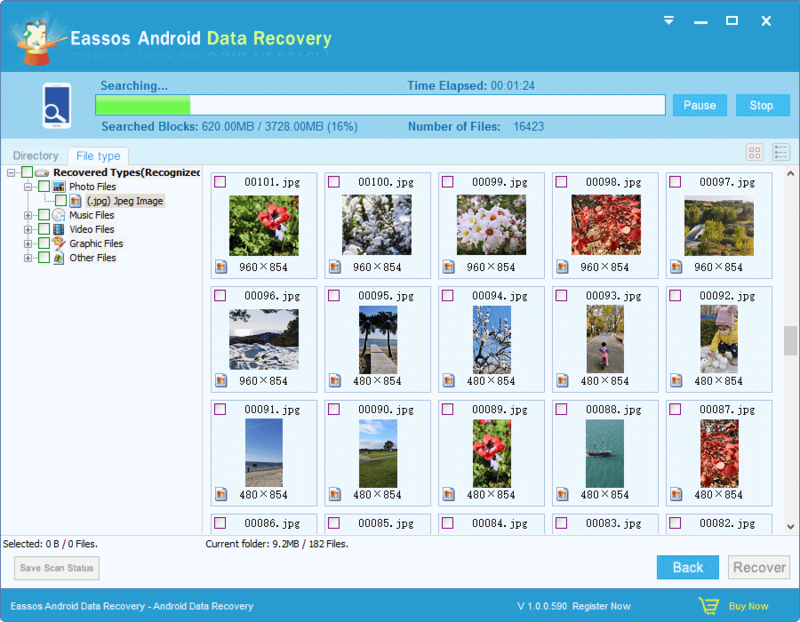 Photos recovery software makes it easy to get back deleted photos or videos, but it is not able to recover lost files which have been overwritten. Therefore, once you realize some photo gets deleted, you should stop using the device until deleted photos are recovered. Any operation on the device such as taking photos can lead to data overwrite and make lost photos unrecoverable. Next, we’ll discuss how to get back deleted or lost photos with detailed steps. Photo deleted file recovery software is designed to recover deleted or lost photos from various storage devices. It is able to recover all types of image files such as JPEG, TIFF, PNG, GIF, BMP, PSD, TIF, JPG, etc., including RAW images like RAW, CR2, CRW, NEF, DNG, etc. Besides, it supports to recover data via simple steps as well as guarantee best recovery result. If you are face photo loss issue, free down photo deleted recovery software and follow tutorials below to get backup lost photos now. 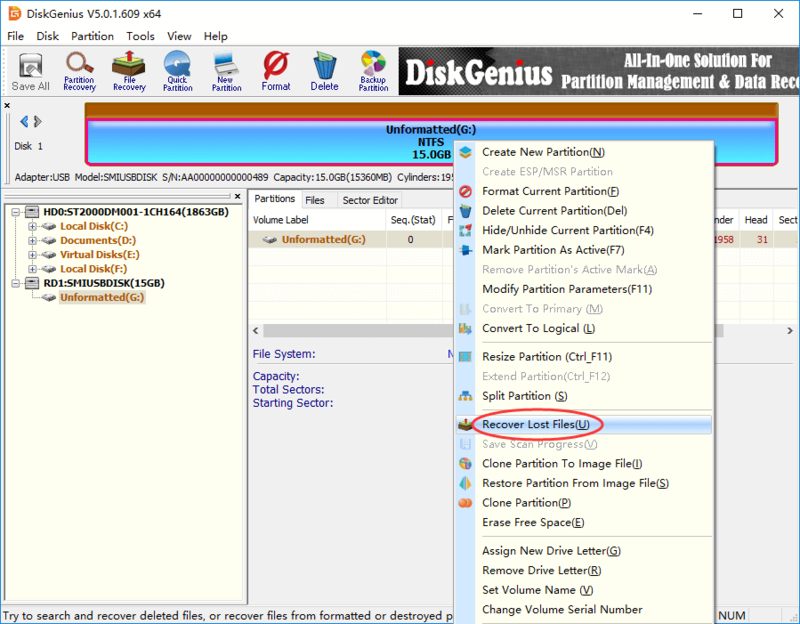 How to get back deleted photos from SD card & PC? This section talks how to get back deleted photos from hard drive, memory card, USB flash drive, external hard drive, etc. with the help of photo deleted recovery software DiskGenius. Download this tool and you can start recovery process now. Step 1: Install and launch DiskGenius from your computer. Note: do not install the software to the drive where deleted photos were stored, otherwise lost files will be overwritten. 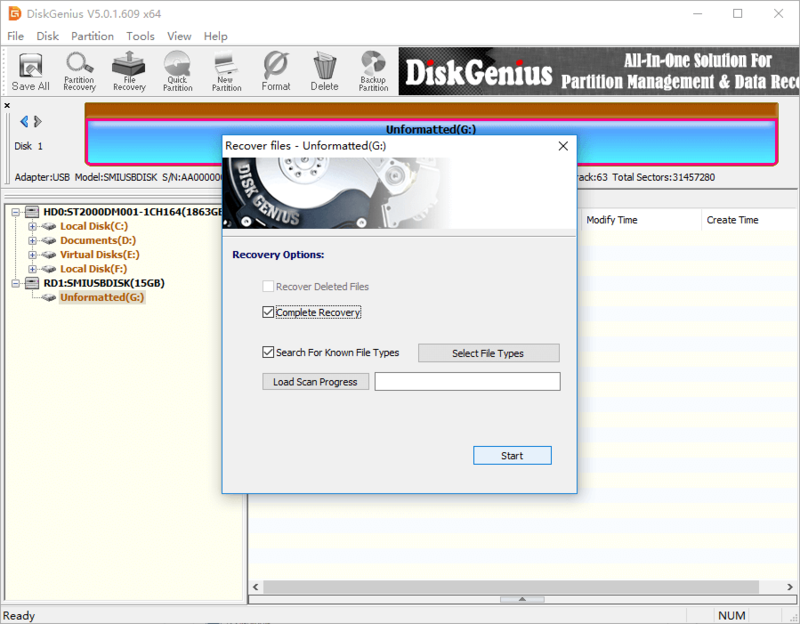 Step 2: In DiskGenius, right-click on the drive you want to recover data and choose Recover Lost Files from context menu. If you want to recover photos from SD card, you should connect SD to computer and make it recognized by the software. If SD card not showing up in your computer, then try a different USB port or card reader. Step 3: Select recovery mode and click Start button to let the software searching for lost photos from selected device. The scanning process is fast and viewable, which lists recoverable files when it is ongoing. Step 4: Preview files in scanning result. Preview files listed in scanning result and check if files are correct. You can double-click a file and then open it in previewing window as below. If the file can be previewed correctly, then the file can be recovered properly after the software is registered. Step 5: Recover photos from device. 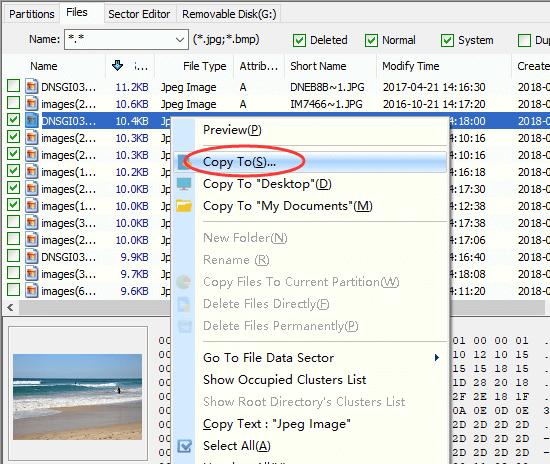 Choose photos and other files you want to recover, and right-click them to select Copy To. Then you can set a location to save recovered files. How to get back deleted photos from Android? 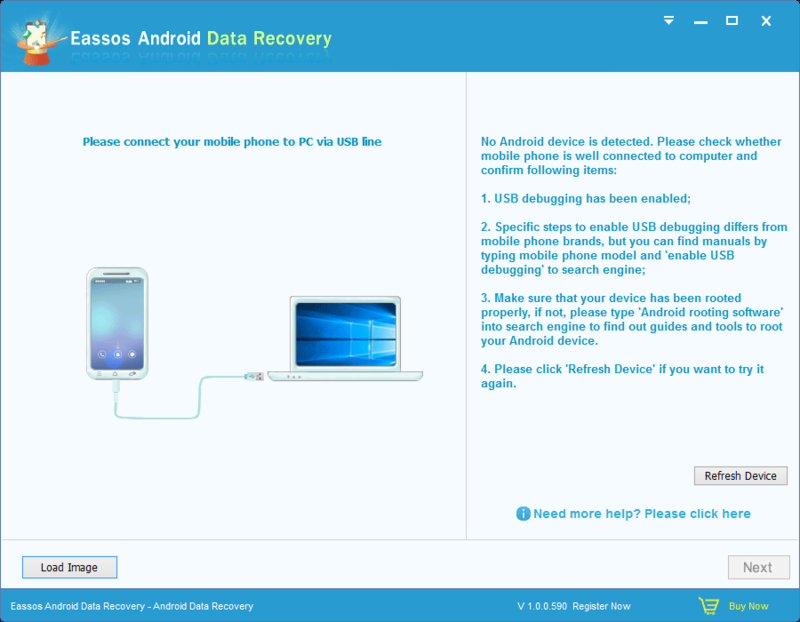 Step 1: Download, install and launch Android data recovery software on your computer. 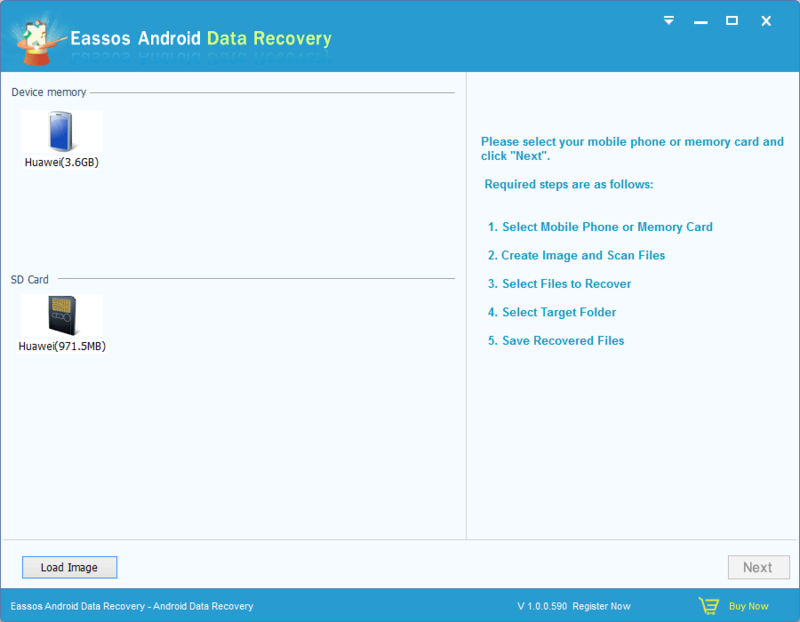 In this guide we use Eassos Android Data Recovery to retrieve deleted photos from Android device, for this tool is effective and very easy to use. Step 2: Once your Android phone is recognized by the software, click Next button. Connect your phone to computer via USB cable and get it properly rooted, after which it can be recognized by the software. Step 3: Select device and click Next button to start scanning process. Some Android phone has two memory location: internal memory and memory card. You should choose the device that stores lost data. Step 4: Preview and recover data. You can preview recoverable files during or after scanning, thus you can find out desired files as soon as possible. Choose what you want to recover and click Recover button to get them recovered. We’ve discussed two guides to get back deleted photos from computer, memory card and Android devices in Windows 10/8/7. You should be able to tackle photo loss issue with ease now. Free download photo deleted recovery software and get back lost photos easily and completely. How to recover my deleted photos? How to recover deleted image/photos from memory card free? This entry was posted in Data Recovery and tagged get back deleted photos, how to get back deleted photos on android, photo deleted recovery software, recover deleted photos by EASSOS. Bookmark the permalink.